Calf skins and basic nappas made precious by focusing on the quality of tanning and finishing to create a more precious product with improved performance. Softness for leather developed through new and delicate fat-liquoring techniques. Veiling of light brush off contributes to personalization in the finishing phase of final products. Laminated surfaces, pearling and new glitters are important. Processes oscillate between minimal stripes and small geometries, and painterly watercolour effects, also multicolour for colour effects, particularly on reptile. Particular interest in certain laser or digital printing processes developed with innovative technologies. Very soft patent leathers, highly coloured, perforated, printed and pearly, light glitter effect; liquid effect in finishes. Lots of innovations in bonded leathers with a mix of materials to create new and interesting looks. In some examples contrasting textiles create the 3D effect but always retaining softness. Bonded doubles, perforated and elasticized continue to be very popular and suitable across all seasons. Painterly colouring, rubberized brush strokes, vintage effects may also be extreme. Crumpled with two types of finish, both glossy and opaque. Metallized finishes with different textures and bases, also on cavallino. The heightened interest in sustainability is translated through research into raw materials that are 100% biodegradable, or in the use of regenerated fibres, steel studs, research into clean coating for synthetics and leather, and PFC free water-repellent finishes. Particular interest in natural textiles, linens, cottons, solid colours and jacquards. Geometric patterns: micro-geometries in two colours and larger geometries, like blocks of colour; beautiful geometries and stripes developed in the weaves. Stripes, bayadere or in two colours, also with inclusion of lurex threads or metalized prints. 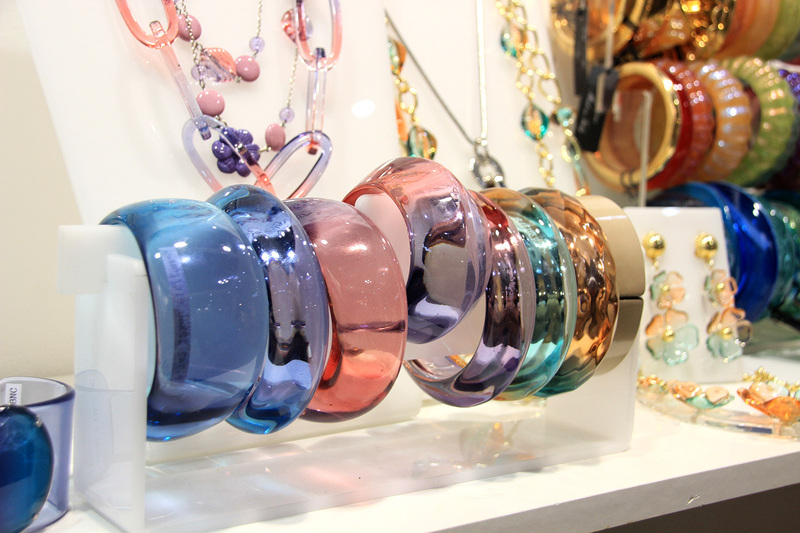 Opaque stripes on transparent or opalescent bases are popular. Confirmation of the continuity of technical sporty materials dedicated to all the world of sneakers. A lot of space for transparent and liquid PU, playing with shine and opacity, with geometric embossing, sheen, gloss on the front, opaque on the back. Effects playing with light: the most precious satins, but still space for flip over sequins with strong contrasts between front and back. Interesting to see sequins attached with invisible threads and with new embroideries, or sequins with innovative shapes. We are still seeing the sheen of glitter, new shimmer, reflective effects on nets, faceted shine on lenticular PU. Single colour transparent rubberized prints on tapes are beautiful. Athleisure tastes are popular, sport elaborated in pastel colours. Laces are renewed, with striped or patterned jacquards and contrasting aglets or aglets in coloured metal. Zips are popular when they are visible, in two-colour combinations with contrasting tape-chain, overprinted with logos, decorated with large and personalized zip pulls. Great interest for zips with seamless but oversize tapes. Medium sized chains move away from traditional galvanic looks and are popular in brighter colours, also in coloured plastic. twin-material studs are popular or studs in various tones of stratified colour, both in the two-component version and when made from a single processed sheet. Experimentation continues on heels: range of heights and widths, coloured mosaics in leather, inlays on woods, Plexiglas also with metallic inclusions or translucent coloured parts and some playing with degradè.